I have been in Penang for almost a year-and-a-half, and I have always loved food! Oh, what's new? I thought I'd compare some simple Ipoh and Penang food today...I'm sure you already know that different states have different versions of the same food, right? The verdict? Both good, in a different way! 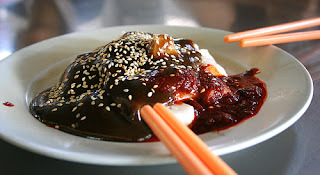 The Penangites sure love their hae-kho (shrimp paste), cos they also put it in their (Chinese) Rojak! 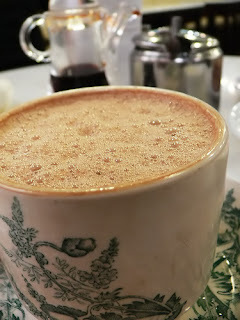 Somehow, the Penang version is slighly 'more lemak', and I heard it's because they use more eggs! Needless to say, Ipoh wins hands down for this...Enuf said! This too, whether roast or white or whatever...The Ipoh version is always soft and fluffy, while the Penang version, er...hard and tough! Ipoh Laksa vs Penang Laksa? None! 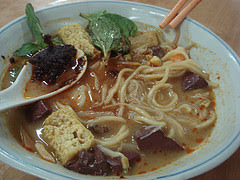 I prefer the Malay version and Sarawak Laksa...=) And for the record, I love Malay food too! Two favourites are the Thai-Malay tomyam, and the Nasi Goreng Paprik! Yeah! I love Sarawak Laksa! 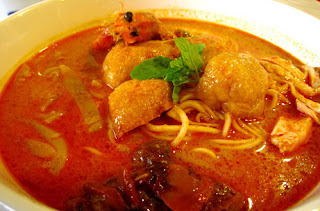 The best laksa! I duno y they keep worshiping penang laksa. Haha! I guess diff ppl have diff taste. Hi Daphne, wow, love your description of the various State's dishes. Surprisingly, we don't really miss all that as most of the Malaysian wives here from the different States cook their State's specialities, i.e. Penang, KL, Ipoh, Singapore, etc dishes. And some had worked in restaurants in Penang etc. Also there are Malaysian, Singapore foodcourt stalls here, as well Banana leaf rice, Indian guy speaks Malay too, "suma pun tarok". BUT? Penang poh pia will always be Penang poh pia, or oh Chien. So enjoy the local foods before you say 'goodbye', ha ha. You have a nice day, Daphne, UL. ps, it's -12c now, snow has turned to solid ice, outside every home snow up to 4 feet high! Forgotten what grass looks like as we've had snow since X'mas! Might snow again later. L.
hehehehe...ipoh's CR's the best then. agreed. Oh Gosh! Malaysian food is the best. Miss all of them. Thanks Daphne for posting the pictures. Tengok gambar melirih air liur. i love all kinda of laksa but my fav would be johor laksa. have u tried tht one? 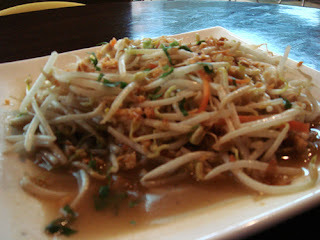 I think I really need a glorious food escapade .. Ipoh should be fine, I guess!! 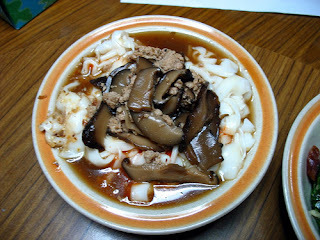 Hong Kong Chee Cheong Fun is available in Ipoh, and I think in Penang too...I like the prawn one actually! Yeap, Sarawak laksa is good...About worshipping Penang laksa, well, I guess if you grew up eating it (and liked it), your chances of liking another version is less? Haha...That's exactly what my aunts and cousins say about Canada! They have almost everything from Malaysia, and some even better! hehehehe...ipoh's CR's the best then. agreed." Sounds a bit wrong, no? Haven't kot...You wanna cook for me when you come back ;)? Yes, food escapade sounds good! Come, come! I will be most honoured and glad to be your food guide...When you wanna come? Let me know, ya? You have my number...=) Looking forward to meeting ya! Penang and Ipoh food will always stand head and shoulders over the rest in Malaysia. 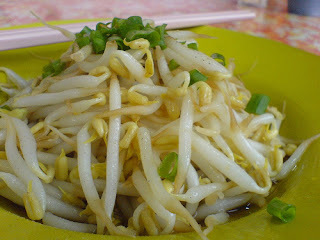 I used to visit Ipoh during my school days and got to taste Ipoh food. Fantastic. But overall Penang food is still No 1. Why? Because I am PENANG LANG. Penang and Ipoh mali food are glorious esp at the side streets. The trick is one must know where to find these little gems - love food but stay healthy. Err, I'm hungry, and it's 11.30 p.m. and those food pictures are not helping! Eh.. Penang CCF where can eat one????? 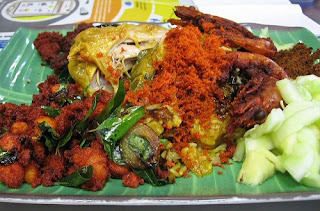 And Penang's CKT is lemak because of the lard they use la.. just add more oil = lemak..
Where's the eggs to do in that? Penang taugeh is really quite hopeless and don't you realise their tau fu has an odd soury taste/smell??? Char ho fan remains unbeatable to me and wan tan mee and :P you know la.. the list of food I miss now that I'm stuck here with the horribly rubberbandish like Hong Kong wan tan mee!! Penang = food heaven? - nahhh..
Oh well.. less people stopping by Ipoh just means more food for me!